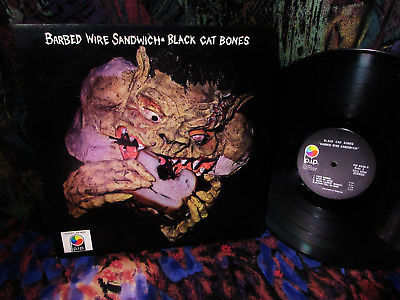 RAREand sought afterORIGINAL 1969 first printing of a slamming hard UK crew by the doom trodden name of BLACK CAT BONES ...their Barbed Wire Sandwich was sadly their only album... killer hard psych blues with fiery guitar theatrics, all over the place! The right place at the wrong time. That could be the epitaph on the gravestone of Black Cat Bones. Having acted as unofficial house band for a number of visiting US artists during the British Blues Boom of the mid to late Sixties, and survived a potentially fatal line-up change into the bargain, they finally made it to vinyl rather late in the day. This, their first and only album, reached the racks in the last months of the Sixties, just as progressive rock was in the ascendancy. That Black Cat Bones remains a known name is due to two musicians whose names remain stubbornly absent from the credits. Celebrated guitarist Paul Kossoff would go on to superstar status as a founder member of Free, but started his musical career in earnest in these ranks. And though neither he nor drummer Simon Kirke appear here, Koss's featured replacement is Rod Price, a player of no mean ability who would later take his axe-wielding skills to Stateside fame and fortune with Foghat. But let's backtrack now to the events that led up to November 1969, when "Barbed Wire Sandwich", was released on the small PIP label. Though retaining semi-professional status for some time, Black Cat Bones had enough going for them to catch the eye of legendary blues producer Mike Vernon. His patronage brought them their first recording session, backing Champion Jack Dupree for a Blue Horizon album, 'When You Feel The Feeling You Was Feeling'; meanwhile, they made a reputation in their own right touring Germany and Scandinavia. Kossoff and Kirke jumped ship, in 1968 after seeing singer Paul Rodgers fronting the similarly unrecorded Brown Sugar; hence by the time Black Cat Bones entered Tangerine and Decca Studios the following year with recording stardom in mind, the existing nucleus of brothers Derek and Stu Brooks on rhythm guitar and bass respectively and vocalist Brian Short had been augmented by Phil Lenoir (drums) and Rod Price (lead guitar). The music kicks off with 'Chauffeur', - a dead ringer heavy jammer in both pace and chord sequence for Free's 'Walk In My Shadow', from their debut, released mere months before. And the well-worn blues metaphor of riding, (Free rode ponies, Black Cat Bones a car - such is progress) indicates the overtly sexual inclinations both shared. Elsewhere, there's a welcome touch of acousticity (on 'Four Women') to leaven the mixture -- but overall, the album very much reflected the electric blues of the stage set, as you'd expect from a band that played live so often . It was left to producer David Hitchcock, who later guided the careers of Caravan, Camel, Genesis (circa 'Foxtrot') and more, to supply the studio expertise they needed to give "Barbed Wire Sandwich", that touch of the unexpected. 'Please Tell Me Baby' stands out in this respect, the band fading in and out around the barrelhouse keys of Robin Sylvester. This would have been impossible live, since Black Cat Bone's line-up didn't feature keyboards (Sylvester was the sound engineer at Tangerine), so was clearly an attempt to diversify and use the studio to greatest advantage. Steve Milliner lent further ivory-tickling skills to 'Feelin' Good'. And, don't forget, Free eventually added the keyboard talents of John 'Rabbit' Bundrick to give them a route to progress . 'Death Valley Blues' was a standard blues-rock number, with the real draws being Price's snarling lead guitar and Shore's vocal. - It took awhile to get going, but the first part of 'Feelin' Good' was one of the prettiest tunes on the album and the quick nod to the traditional 'God Rest Ye Merry Gentlemen' was pretty funny. Price turned in one of his best performances here. - A growling, sinewy slice of blues-rock, 'Chauffeur' was as good as anything Free ever did. The lyrics aren't anything special, but the end result was easily the best track on the album this one had FM radio potential all over it. - Penned by Price, 'Sylvester's Blues' started out as a formidable acoustic blues number, before morphing into a up-tempo blues number. Professional, the highlight is a bit of Rod Price slide guitar. - Another Price original, 'Coming Back' was another pedestrian blues-rocker. The song sported another nice Price solo. - With Short turning in one of his best vocals and as one of the few songs to stray from their patented blues-rock repertoire, side two started with the album's most surprising performance with the intense 'Four Women'. - 'Save My Love' found the band channeling their Cream roots. Nice blues-rocker with an emphasis on rock. - The blazing 'Good Looking Woman' with Rod Price turning in his lone lead vocal, the highlight comes in the form of the twin lead guitar workout from Derek Brooks and Price. - Built around engineer Robin Sylvester's barrelhouse piano 'Please Tell My Baby' sounded like a studio goof. The in and out fades were simply sign of the times. this grade is abused by many, VG here does not mean "trashed"
Do Not Bid If You Are Not Serious About Following Through The Transaction! ALL ITEMS GUARANTEED FOR WINNING BID -LESS SHIPPING!